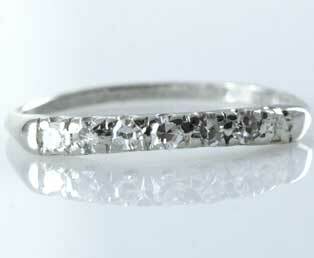 Enjoy the warmth and beauty of seven bright diamonds in this 1940s diamond platinum wedding band. This seven diamond ring is slightly concave, which should enhance alignment with your antique engagement ring. This ring was made in durable platinum (PT950) and is in very good condition. This estate wedding ring has a tender date inscription of 5/41.